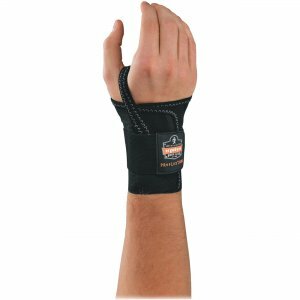 Durable elastic wrist support limits downward (flexion) wrist movements to avoid further injury. The patented, Open-Center Stay reduces pressure on the median nerve to help you be more comfortable. Single-strap design features a three-stage, hook-and-loop closure to secure the support on your wrist. Machine-washable support also includes anti-odor treatment to help workers remain unscented. Use the ProFlex 4000 Single Strap Wrist Support in food processing, picking/packing and assembly/fabrication. Small size fits wrists up to 6".